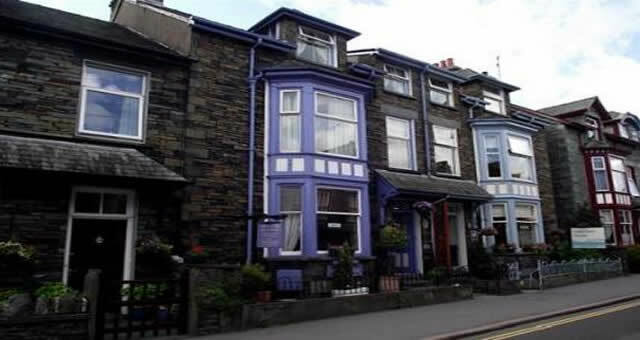 Thorneyfield Guest House015394 32464work Guest HouseThorneyfield Guest House sits at the heart of Ambleside nestled in the Lake District. 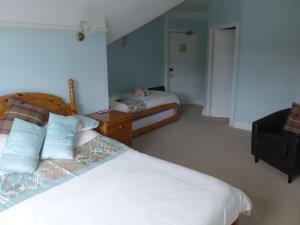 This 6 room fairtrade and green B&B provides a comfy locale from which to base yourself for a stay in this delightful region. We, Andrew and Carole Drummond Smith, look forward to hosting you and making your stay as pleasant as possible. Ambleside is situated between Windermere and Rydal Water. This makes it the ideal resting place for any Lakeland explorer. To top off Ambleside's perfect location for trekkers and explorers, we sit at the crossroads of many bike trails and walking routes. All the more reason to call Thorneyfield home whilst discovering the Lakes. Ambleside is an ideal location for relaxation; boasting several spas, and some of the UK's finest and most innovative restaurants. Moreover, the surrounding lakes provide the perfect situ for genteel exertions. Front of House from Compston Road. 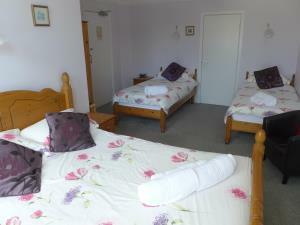 Thorneyfield Guest House sometimes limits bookings to 2 or more days. Pine beds and pine furniture with full size single beds for children. Kings size pine bed with fell views and pine furniture. room 5 sometimes limits bookings to 3 or more days. 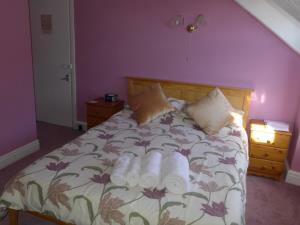 Good position in town, easy parking, pleasant room , welcome and tasty breakfast. Thank you, it was a delight having you stay with us. 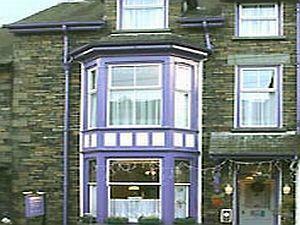 Thorneyfield Guest House sits at the heart of Ambleside nestled in the Lake District. This 6 room fairtrade and green B&B provides a comfy locale from which to base yourself for a stay in this delightful region. Whether it be boating, spa therapy, a restaurant break or anything else which tickles your fancy, Thorneyfield is the ideal starting point from which to do so. Books and DVD's are available along with a selection of board games. Children welcome from age 4. From the south leave the M6 at junction 36 and follow the A590/A591 following signs for Kendal and then Windermere. Keeping straight on this road, signs for Ambleside will appear as you go approach Windermere and Ambleside is approximately 5 miles from Windermere. Coming in to the village you come to set a set of traffic lights where you can turn left and follow the road round until you come in to Ambleside keeping to the left hand side of the road. If you miss this turn don't worry as the one-way system will guide you round to the same road. As you go past the White Platts recreation ground to your left, you will then see the Gables followed just after that by The Thorneyfield. Just keep your eyes out for the purple property! From the north, you can leave at junction 40 on the M6 following the A66 to Keswick where you will join the A591 via Grasmere to Ambleside. By train, the nearest mainline railway station is Oxenholme, where you can get a connection to Windermere and a bus or taxi from there to The Thorneyfield. slate flagstones with three steps up to the door. We have no provision for wheel chair users or severe mobility problems, all of our bedrooms are upstairs on either the first or second floor. Sorry for any inconvenience.